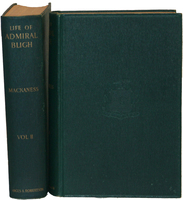 The Life of Vice-Admiral William Bligh R.N. F.R.S. 2 vols. BLIGH William. (By G. Mackaness). Sydney 1931. Royal 8vo. Orig. cloth. With frontispiece 42 full-page plates of which 4 are double-page and fold. map. 1st ed. The definitive biography. Rare.